A friend I often term ‘the Oracle’, thanks to his insightful and objective commentary, suggested I initiate a conversation about fashion and technology on Remarqed. I thought to myself: do they interact now? Where can they interact? How will they interact? My first thought was to my Lululemon* clothing, which two years ago, when I first discovered the brand and starting buying, was my first notable use of worn technology to solve sportswear problems. Silver fibers cut down on stink, strategic venting helped wick sweat off skin (how our bodies cool themselves), and proper fit ensured ease of sporty movement. Those were passive technologies…made up front, with an intended effect later down the product lifespan. Sunglasses polarization is another example of passive technology. Personally, I love products and fabrics that are engineered for durability using technology. Better fabrics and compartmentalization mean fewer stains, spills, less need for careful use. I realized long ago that leather is beautiful, but nylon and thick cotton duck (canvas) are scratch-resistant and are fully- or spot-washable. Nylon especially looks futuristic and wears age well, whereas leather, if used and abused, can look rough quickly, showing scuffs and markings. 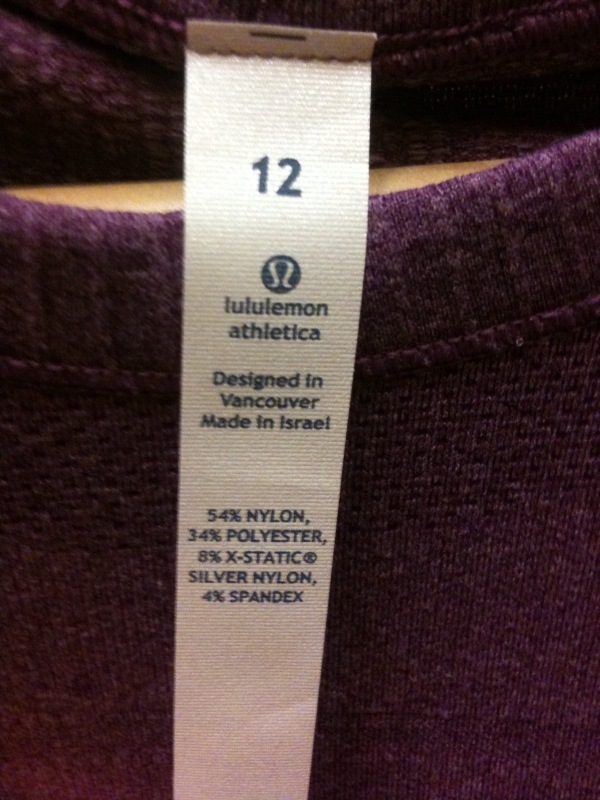 Lululemon shirt label, full of great synthetic fabrics. My Lululemon love sprang from an entire line of exercise-oriented clothes that fit well, held up beautifully, and were designed to be worn 24/7 in life, not just for running or yoga. On the one hand, not being all-cotton is sometimes negative. The technical fabrics used by Lululemon were almost no cotton, but were just as soft and colorful as they should be. By nature of not degrading as quickly (typically a benefit of synthetics), they didn’t stretch out or shrink, didn’t get sweat stains, and still look good, 3+ years later. But what about active technology? What sorts of active technologies will improve durability? Could clothing or accessories change their physical properties or adjust settings to address changing conditions or uses in real time, using a circuit or interface? That would require a power source, which implies a cord or bulky battery. Or does it? Researchers are moving forward on flexible batteries that can be weaved into fabric. Almost all advances in consumer products today revolve around improved technology. Appliances and cars are more intelligent, autonomous, and efficient. Phones now do most of what computers do, and all the minor gaps in personal computing are being filled with tablets and nationwide cordless internet connectivity. Even more than products, many consumer processes revolve around better, more accommodating technology. Connecting with friends, paying bills, making phone calls, and doing research – they’re all quicker, easier, and more convenient because of technology. The PopSugar app, formerly known as ShopStyle…one of my favorites. And its heart, technological research is driven by how it will benefit the consumer, and how the consumer wants technology to assist, rather than interfere or constrain. When pairing fashion and technology, some questions to consider may be: what are the problems we face with our clothing? What would make them better, more predictive to our needs? What about making the process of choosing and buying clothing easier? I am a big fan of the PopSugar Shopping app (formerly known as ShopStyle). It’s anyone’s guess what might prosper and become mainstream as circuitry and battery power become smaller scale. PSFK provides a good overview of fashion and technology trends, like a wearable LED screen and game controller, wearable solar panels, bespoke blazers that wick and store heat for later dispersion, and garment visualization technology for a more reliable online purchase. Technology could be applied in many different ways, to improve use, quality, longevity, or even reusability over time…the possibilities are endless. I’m going to read and absorb more, and hopefully return to this topic. It is very exciting. *Lululemon of late has gone in a direction I do not like, at all. Quality is different, the fabrics are lower quality (less sturdy), and the fit isn’t consistent season to season. My older Lululemon shirts and shorts are in better shape than shirts I have had for less than a year.